Three weeks. If nothing else, I’ve done that. Today was deep-clean day and I had a semi-emergency. Took almost five hours to complete because I realized (after completely wiping clean and drying it) that the left kreisel had sprung a leak. Freshwater was dribbling in. I must have wiped a little too vigorously at the silicone (it was filthy). I was home alone and needed about five hands, but somehow I managed to plug the outside (under water) with one hand, dry the inside completely with a second hand, and silicone the leak with a third hand. Still not sure how I did it. It was one of those emergency out-of-body reactions like lifting a car off of your child. And after staring entirely too long into the newly-cleaned water of the other tank, I’m confident saying that we are entering stage five. Next stage is megalopa!! (That’s when they get claws and start looking for shells.) Very excited/worried about that. Rough population count puts the total at right around 500. Deaths will go up today, because of the stressful deep clean of the tanks, but it’s always a balancing act between more dying from NOT cleaning the tanks versus more dying from cleaning them…and they had gotten pretty slimy and gross. The other source of additional deaths today will be from the difficulty of entering stage five. 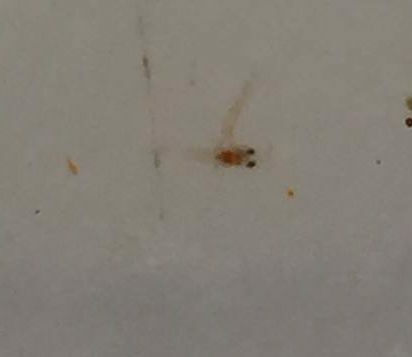 This picture shows one that’s half stuck in his exoskeleton (the shed exo is the pinker tail going vertical—the new, freshly molted tail is almost clear and extends behind the orange abdomen). It’s just hanging on, probably stuck on the new leg structures. I’m seeing this a lot today—as their bodily structures become more complex, the sheds become more difficult and dangerous. This is one of the reasons I went with reef salt, because it has higher calcium which I thought would help them to have sturdier exoskeletons. I did a calcium test just to be sure, and the numbers are good, even a tad higher than a normal reef.